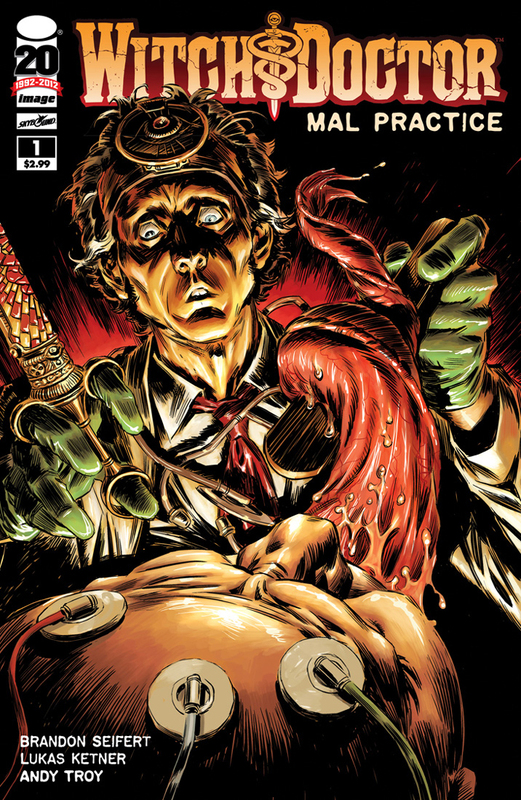 [From Image Comics:] Meet Vincent Morrow, a doctor looking for a vaccine… for the apocalypse! Well, it’s true. Kind of. Vincent Morrow has the same kind of snarky, no-nonsense attitude, and superiority complex; but he’s also quirkier than House, which is part of what makes Witch Doctor so fun. He’s an intentional study in contrasts when put alongside the stoic, demon-possessed Penny Dreadful and the more, well, human ex-paramedic, Eric. The characters just bounce off each other so well, their interactions would probably be fun even without the crazy storylines. Thankfully, though, we don’t have to see if that is actually true, because the storylines are crazy, while simultaneously following an internal logic of the-supernatural-as-medical, which is explained in such detail, and with such authority, that it sounds completely believable. It’s an interesting take on some old ideas, which allows for a matter-of-fact reimagining of even the most well-worn ideas. And, hell, it’s enjoyable to boot. Lukas Ketner’s art perfectly compliments Brandon Seifert’s writing, particularly when it comes to his creature design. Not only are they horrifying, but you can tell that a lot of thought has been put into making them appear like they could actually be based on physical creatures that could exist in a version of our world that had magic. There’s a level of detail there that makes them feel more real – and looks great, to boot. The only complaint I have about Witch Doctor is that there aren’t more comics in the series. Hopefully Seifert and Ketner have the time and inclination to fix this problem in the not too distant future.